, a celebrated saint of the Romish church, and founder of one of the four orders of mendicant friars, called Franciscans, was born at Assisi in Umbria, in 1182. 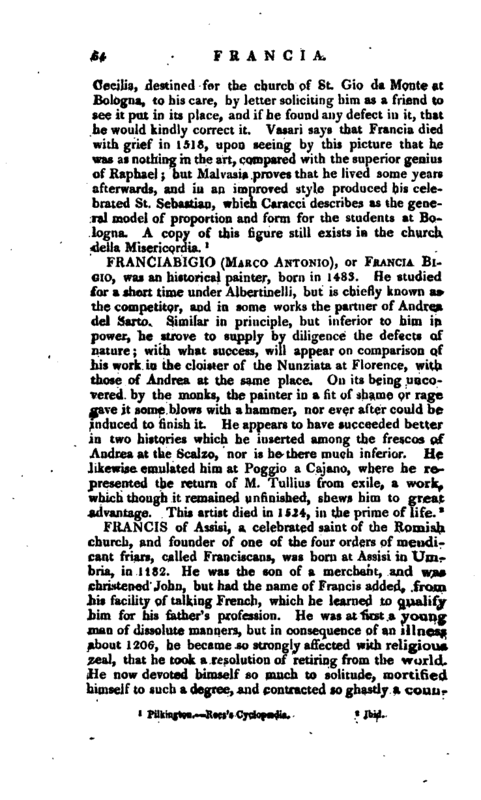 He was the son of a merchant, and was christened John, but had the name of Francis added, from his facility of talking French, which he learned to qualify him for his father’s profession. He was at first a young man of dissolute manners, but in consequence of an illness about 1206, he became so strongly affected with religious zeal, that he took a resolution of retiring from the world. He now devoted himself so much to solitude, mortified himself to such a degree, and contracted so ghastly a | countenance, that the inhabitants of Assisi thought him distracted. 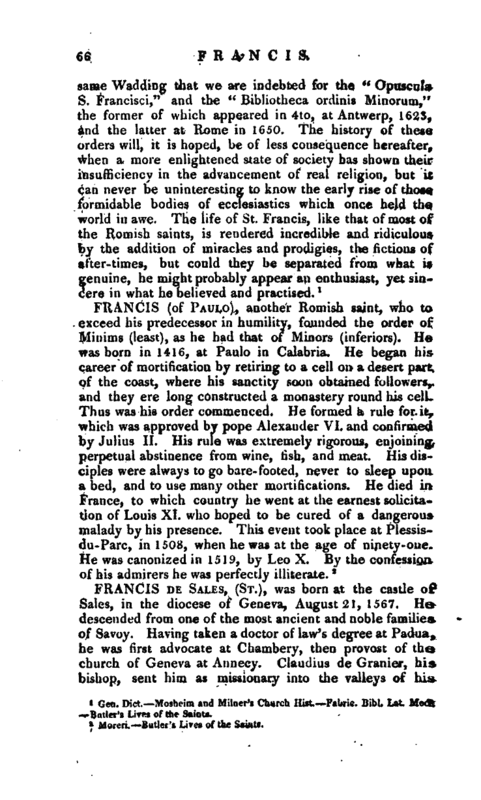 His father, thinking to make him resume his profession., employed a very severe method for that purpose, by throwing him into prison; but finding this made no impression on him, he took him before the bishop of Assisi, in order to make him resign all claim to his paternal estate, which he not only agreed to, but stripped off all his clothes, even to his shirt. He then prevailed with great numbers to devote themselves, as he had done, to the poverty which he considered as enjoined by the gospel; and drew up an institute or rule for their use, which was approved by pope Innocent III. in 1210. The year after, he obtained of the Benedictines the church of Portiuncula, near Assisi, and his order increased so fast, that when he held a chapter in 1219, near 5000 friars of the order of Minors (so they were called) were present. 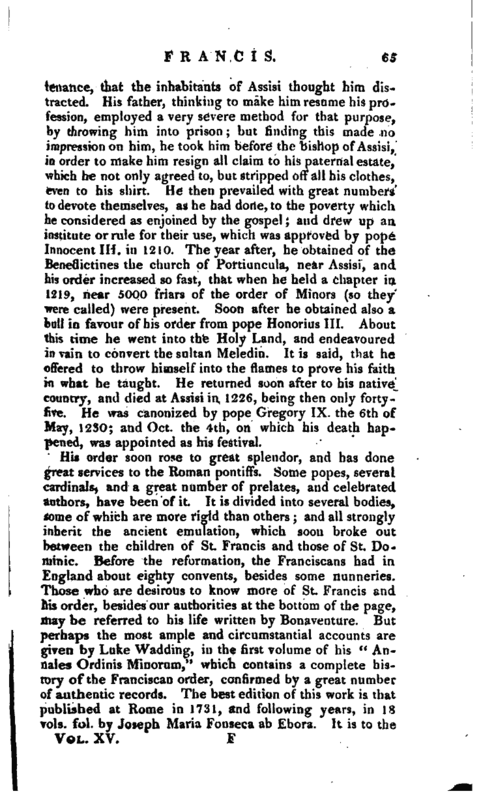 Soon after he obtained also a bull in favour of his order from pope Honorius III. About this time he went into the Holy Land, and endeavoured in vain to convert the sultan Meledin. It is said, that he offered to throw himself into the flames to prove his faith in what he taught. He returned soon after to his native country, and died at Assiai in 1226, being then only fortyfive. He was canonized by pope Gregory IX. the 6th of May, 1230; and Oct. the 4th, on which his death happened, was appointed as his festival. Gen. Dict.—Mosheim and Milner’s Church Hist.—Fabric. Bibl. Lat. Med. —Butler’s Lives of the Saints.